A Regrettable Reputation is a love story, set in Yorkshire in the year after the Battle of Waterloo. The Duke of Wellington is still in France with the Army of Occupation, and at home it is a time of change, of the Industrial Revolution and of social upheaval, especially in the textile towns of the north which are rapidly growing into cities. 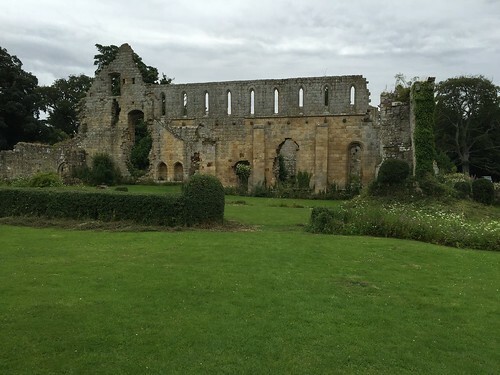 Nicholas Witham is a former officer of light infantry, seriously wounded at Waterloo, who has found employment as a land agent managing the Yorkshire estate of Lord Ashberry. Into his peaceful, well-ordered life comes Camilla Dorne, a woebegone heiress whose elopement ended in disaster and disgrace and who has been sent away from London with her reputation in tatters. Before long the very respectable Mr Witham realises that Camilla is not at all what he might have expected, while Camilla begins to realise that the loss of her reputation might not be the disaster she had thought. A Regrettable Reputation is the first of the Light Division romances, a series which follows the fortunes of some of the officers and men of the Light Division beyond Waterloo. It features several characters from the Peninsular War Saga. The second book in the series, The Reluctant Debutante, is also available on Amazon in kindle and paperback. The hiring fair and market took place on a the Horse Fair which was a large field just to the east of the market square. There was a full market in the town as local farmers and traders took advantage of the increased business, and it spread along the high street and spilled out onto the field. The town was packed with people from all walks of life and Nicholas wondered for a moment if he had been wise to bring the girl. He drove down to the Red Lion and handed over his curricle to the grooms, glancing at her face. She was looking around, bright eyed and interested and he remembered that she had spent much of her life in the crowds and noise of London and was unlikely to be overawed by a country fair. He helped her down and turned to Taggart to give him his instructions then offered his arm to the girl. They strolled into the throng, pausing occasionally to look at a stall. The lawyer’s office was situated in a tall Georgian building with long windows and colonnades outside. A maid admitted them and led them upstairs where Mr Arnold himself came to greet them. He was a bewhiskered gentleman in his fifties with a friendly smile and he shook Nicholas’ hand and regarded Camilla with polite surprise. Seated in Mr Arnold’s office, Nicholas moved quickly on to business and the lawyer did not object. The matters were not complex and did not take long. When they were concluded, Arnold rose and went to pour sherry. “Oh no,” Nicholas said softly. Nicholas found Camilla in conversation with Mrs Cobb, the housekeeper. He had noticed before that she had very easy manners with the servants and with the exception of Mrs Hogan, the staff at Ashberry Hall had taken her to their hearts. Even the grooms had nothing but good to say about Miss Dorne. Nicholas offered her his arm with a smile. The hiring fair was new to Camilla. She had heard about them, but growing up in London was more accustomed to staff arriving through the employment agencies which were springing up around the city. She looked around with interest at the different groups of people, men and women, who had come looking for work. The various types of labourers and servants stood together, wearing or carrying some item which would indicate their particular trade or skill. Shepherds used bunches of wool, housemaids a sprig of broom, milkmaids carried a milking stool. “What are the ones wearing the ribbons on their coats?” she asked. 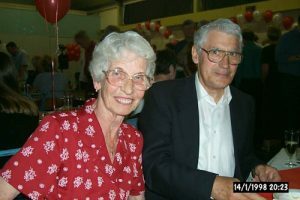 In the historical novels of Lynn Bryant so far, those of you have read all of them will have realised that most of them are linked in some way. I thought I’d provide a short guide to finding the links. I’ve always enjoyed a good series of books, which is what led me to starting the Peninsular War saga. But I also like to discover connections between characters in other books which I might not have expected. I’ve had messages from a lot of people working their way through the novels asking about sequels. To be completely honest, when I started out I’d written the first four books in the Peninsular War saga and three standalone historical novels. Chatting to readers online, however, quickly made me realise two things. Firstly that other people love connections and sequels as much as I do and secondly, that there were so many common themes and links in my books that it was very easy to introduce my characters to one another. With the exception of A Marcher Lord which is sixteenth century, all my books so far are set in the nineteenth century, a lot of them during the Regency and the time of the Napoleonic Wars. All of them feature connections with the army, either a soldier or an ex-soldier. More than one of my characters came from Leicestershire or Yorkshire. Out of that came the idea that I could very easily link my books together, creating a historical world within the wider, real historical period. It required very little effort to change a regiment. Some of the links fell into place completely by accident. I’d given the same surname to Kit, a soldier of the Victorian era and Gervase Clevedon, one of the minor characters in the Peninsular books, but when I realised that Kit had inherited from an uncle, I quickly worked out that Gervase could very easily have been that uncle. Other connections were created deliberately. Before I published The Reluctant Debutante, I was well aware that Giles Fenwick had started his army career in my fictional regiment the 110th. For those who have only read one or two of the books, I thought I’d provide a guide to the characters and their connections which I’ll add to and repost as new books are published. I’ve listed the books here in chronological order rather than publication order. So far this one is a standalone novel. 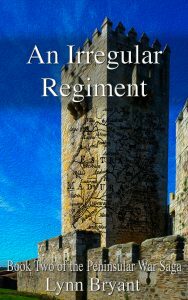 The first in a series of around ten books set in a fictional regiment, the 110th infantry, during the early nineteenth century. Direct sequel to an Unconventional Officer this follows the lives of officers, men and their women through the campaign season of 1810 – 11. Direct sequel to An Irregular Regiment this follows the 110th through 1812 and the battle of Fuentes d’Onoro. Direct sequel to An Uncommon Campaign, to be published in September 2017 this follows the characters of Wellington’s army through the campaigns of 1813 as far as the storming of Badajoz and the push into Spain. A Regency romance following the story of Nicholas Witham. Like Giles, Nicholas sold out of the 110th after Waterloo. Nicholas appears for the first time in An Untrustworthy Army, book five in the series which is currently being written, along with his closest friend Simon Carlyon. Simon is the younger brother of a major character in An Unconventional Officer and I suspect we’ll be seeing more of Simon. There is also the opportunity in this book to see a little of the rest of Anne van Daan’s family, back home in Yorkshire. In addition there is a cameo appearance from the Earl of Rockcliffe. This is a Regency romance following the story of Giles Fenwick, Earl of Rockcliffe who was formerly a junior officer of the 110th and then one of Wellington’s exploring officers. He is first mentioned in An Irregular Regiment and will crop up from time to time throughout the Peninsular War saga. There are several mentions through the book of characters Giles has known from his war service whom you will have met in the other books. This is set in Victorian times. Kit Clevedon, the hero of this book, is the nephew of Gervase Clevedon from the Peninsular War series, and the officers Philippa meets in Africa are from the 110th. This book is currently being written and it’s a working title. It is the sequel to A Respectable Woman and tells the story of Kit and Philippa’s children. In terms of chronology, there are a number of books in the series which will slot in to this list. I’ve been asked about sequels to most of the books by now, and I’d love to do it but I can’t say when. Sometimes a book just suggests itself. 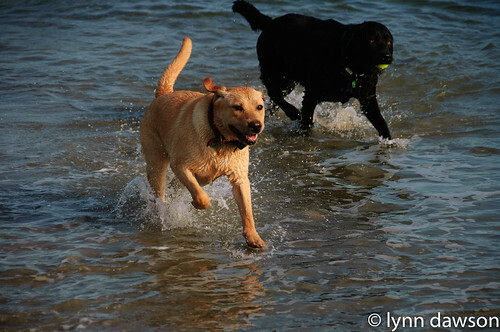 Writing with labradors has undergone a few changes this week which will hopefully make the site easier to follow. One new feature is the freebies page which now includes the first chapter of all seven published books. It also includes the first chapter of book 4 of the Peninsular War Saga. 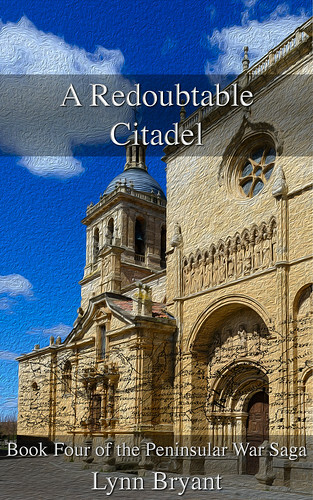 A Redoubtable Citadel comes out next month and takes Paul van Daan and the 110th through the horror of Ciudad Rodrigo Badajoz and puts Anne in the worst peril of her adventurous life. Read chapter one here. 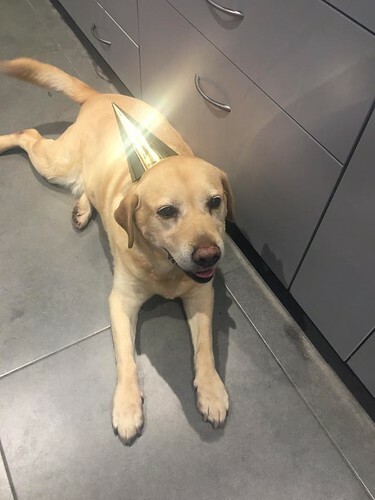 In addition to the sample chapters, I intend to upload a few other freebies as I go along so watch this space for more Writing with Labradors updates and improvements. I’m also intending to introduce a separate travel section for those of you who are interested in history and might be considering visiting some of the areas depicted in the books. Thanks to all of you who are following both this site and the Facebook page, reading the books and taking the time to review and rate them on Amazon and Goodreads. If you want regular updates, articles and information on history, travel, book reviews and a few freebies thrown in, you can now join the e-mail list here. 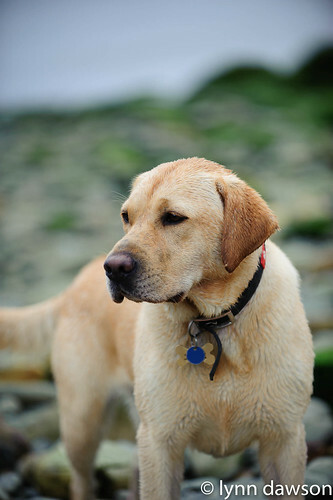 It feels like a good time to celebrate Writing with Labradors – the first six months. I published my first e-book, a Respectable Woman, on Amazon kindle on 22 February which is actually rather less than six months ago. I feel like celebrating today, though. I’ve just received a parcel with several author’s copies of the first of my books to be published in paperback and there is something amazing about actually holding a copy in my hand. I dreamed of being a writer when I was a teenager but back then it didn’t seem like a possibility at all. Over the years I’ve written more words than I can remember and I made numerous attempts to find an agent or a publisher for my novels. I often wonder how many people actually read any of what I’d written. What is clear to me is how many people have read what I’ve written now. Since publishing A Respectable Woman back in February, things have gone better than I ever imagined. I’ve sold books, I’ve received reviews and ratings, most of which have been good, and I’ve had a lot of messages from readers telling me how much they’ve enjoyed the books. I’ve set up a website and written a blog and an author Facebook page. I’ve joined Twitter, which is something I never thought likely and I’ve begun to learn, by tiny steps, about marketing and selling books as well as about writing them. There have been so many good things during these months that I’m a bit overwhelmed. People have been incredibly supportive and I’m so grateful to all of you who read and comment and encourage me. So far, all the books I’ve published were already written when I made the decision to publish independently on kindle. This weekend I am publishing the first book which I’ve written from scratch since then and it’s a regency romance. I have a few books floating around in my head at present, and before I started this, I admit that I wouldn’t have thought the next book I wrote would be another regency. This decision was based purely on the success of the previous regency, The Reluctant Debutante which has proved the most popular of all my books so far. When I began to get ratings and even a few reviews for the books I was very excited. There is something fairly astonishing that complete strangers are reading my books and apparently enjoying them. There was also the unpleasant shock of a bad review. I’ve had a couple, not too many, and I now understand why experienced writers recommend that you try not to read the reviews. It’s difficult to avoid when you’re independently published; you want to know something about what your readers think and it’s very tempting. I am trying not to now. I can’t change the way I write because one or two people don’t like it. The books are selling and people are buying more than one of them which I’m guessing means they enjoyed them, so I am going to try to stay away from the reviews. A bad review is painful; a good one feels great. I’ve decided to leave them alone and just write. Still, going by sales alone, a second regency makes a lot of sense. I really enjoyed writing this one. It was good to come up with some new characters and good to research a subject I knew very little about. I have written a slightly different kind of heroine this time and I hope my readers like her because I really do. My next published book is likely to be the fourth in the Peninsular war saga, which is already written although needs some revising. A Redoubtable Citadel is the most difficult book I’ve written so far, a very emotional one for me. I am also planning on a book with a Manx theme but there is a fair bit of research involved in that. I have a children’s story which I want to finish, and I’ve got an idea for a sequel to one of my original books. I also need to get on with book five which is about half way through. It’s been an amazing first six months and I’m looking forward to more in the future. Thank you to everyone buying the books, sending me messages, engaging on the Facebook page and writing reviews and ratings – even the bad ones, since they remind me to keep getting better. I hear the sounds of barking labradors in the distance which reminds me that it’s breakfast time. I couldn’t have done this without all of you. I also couldn’t have done it without Toby and Joey, my constant companions, who never forget to remind me to stop work for a meal time. In the event it was several weeks before Miss Dorne made an appearance. It was a damp afternoon and Witham had spent the morning writing letters and doing accounts before joining the grooms as they exercised the racehorses. He rode back to the stables with the lads to find a post-chaise drawn up on the carriage drive with luggage strapped to the roof. Witham sighed and waved for one of the grooms to come and take his horse. He had no desire to converse with a spoiled woman with a lost reputation, but common civility demanded that he at least introduce himself. Giving the lad some brief instructions about the horse, he walked up to the house as the driver was lowering the carriage steps and opening the door. Mrs Hogan, the housekeeper was standing stiffly at the front door. Witham approached the two women. Miss Dorne turned. “How do you do?” she said again. Her youth startled him. He had been expecting an older woman given her unfortunate reputation but this girl could be no more than eighteen. She was slight and fair, with a pale oval face and expressive blue eyes. There were dark shadows under her eyes which looked like bruises. She looked painfully thin with a fragile delicacy which unexpectedly touched his heart. Whatever she had done wrong, somebody should be looking after this girl and she was here alone many miles from home and family. She disappeared inside the house and Witham stood watching as the servants began to unload her luggage from the top of the carriage. There was a sense of immense loneliness about her. It was hard to imagine her laughing and flirting with her lover before disaster had overtaken them. She looked defeated. Mrs Hogan reappeared at the door, watching the last of the boxes being carried inside. “A hussy if ever I saw one!” she said sharply. “God save us, Mrs Hogan, she’s a child!” Witham said shortly. He watched, amused, as she stormed back into the house, and then turned and walked towards the Dower House wondering with some sympathy how Camilla Dorne would cope with the lonely isolation of Ashberry Hall. 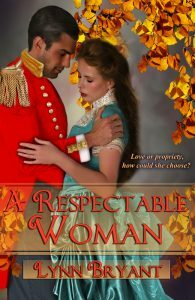 A Regrettable Reputation, a Regency romance, is the first book in the Light Division Romances which follow the varying fortunes of the men of Wellington’s elite troops once war is over. Now available on Amazon kindle and in paperback at the Amazon store. 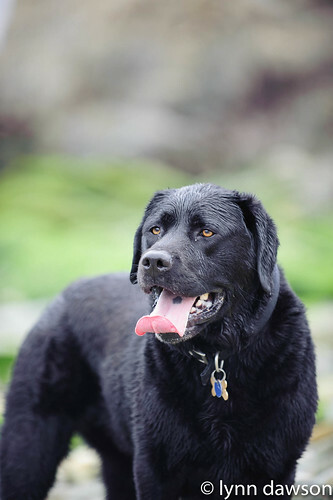 Writing with Labradors, and Blogging with Labradors came about as something of a joke when I was first setting up my website. 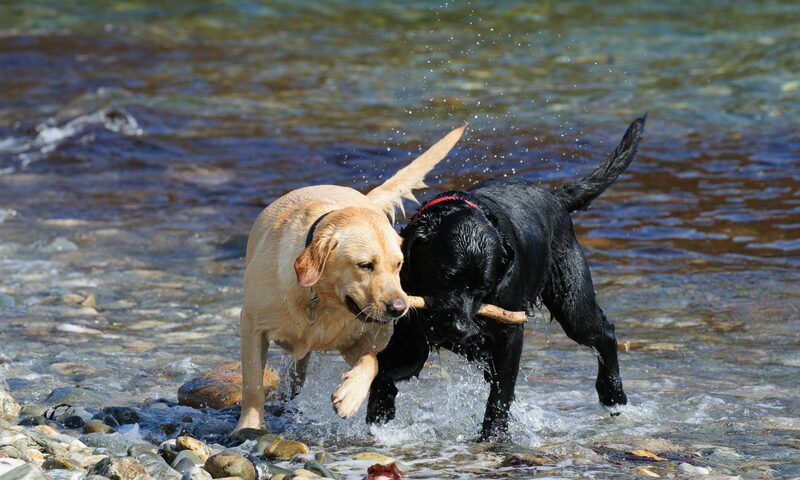 It’s proved popular and I’ve stayed with it…hence the presence of Toby and Joey in our local newspaper this week. 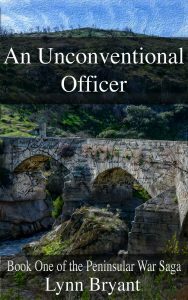 I spent some time thinking about publicity yesterday now that An Unconventional Officer has been published. 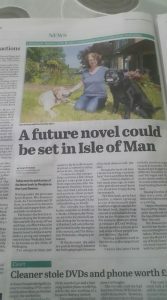 There was a nice article in our local paper the Isle of Man Examiner about the release and I’ve been asked to do Manx Radio as well. I can remember one of the first posts I wrote on this blog talked about my concerns regarding publicity. I’ve never been much of a self-publicist and I honestly thought I’d struggle more than I have, but I’ve made myself do it because once I had taken the plunge and published the books it seemed pointless just to let them sit there and take their chances. And I’ve actually quite enjoyed it. For anybody interested in psychology, marketing and reaching the right audience is a nice little challenge. I’m still learning but I think I’m getting better. It helps that the books are selling – not in their thousands, but steadily. It also helps that I’ve had one or two nice reviews and some four and five star ratings on places like Goodreads and Amazon. There’s something very encouraging about knowing that people are reading and enjoying the books enough to review them. All my reviews are from complete strangers, I hope they have some idea how much it makes me smile. One of the interesting things I’m learning is what people like. I grew up with Regency novels and loved them, and I’ve read a few more recent ones. The Reluctant Debutante was my tribute to those and I’ve been astonished at how popular it’s been. I had already thought I would write another Regency just because they’re so much fun, but I’m already planning it. 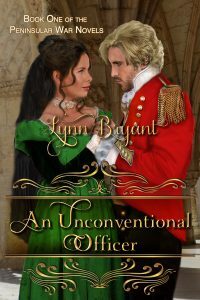 An Unconventional Officer is also set in Regency times and although it’s a far cry from the London Season of Cordelia and Giles, it is about the war which affected everything during those years. 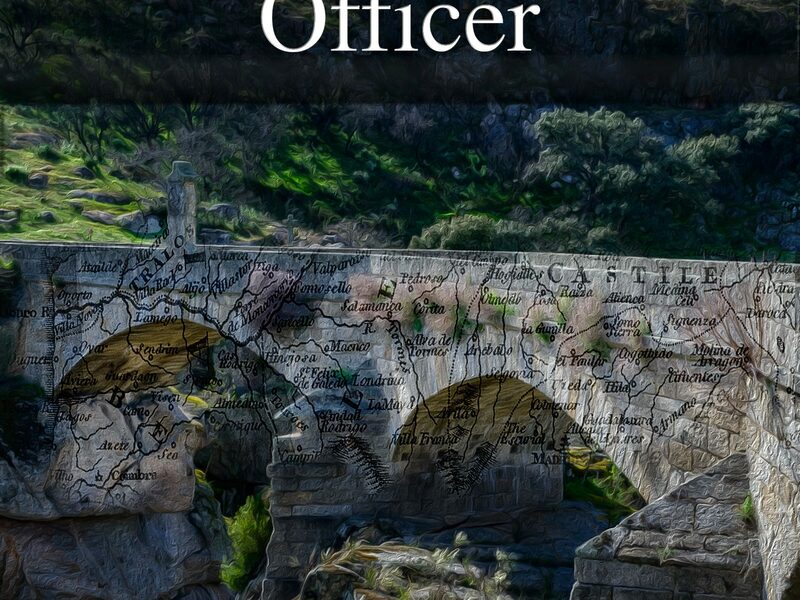 It’s a longer book than any of the others and is the first in a series which follows the men and women of a fictional regiment through the years of the Peninsular War. I loved working on this book; it’s a bigger canvas with a large cast of characters and the best part is that I don’t have to say goodbye to them at the end of the book. I’ve done a lot of research for these books. Earlier I saw an article in the Guardian which caught my attention about the relationship between academic historians and historical novelists which I found really interesting. I’m sure there are a lot of academics who dislike historical novels, particularly where they take very obvious liberties with history. Equally there are non-academics who don’t like them much either. And there are people who like science fiction and chick lit and thrillers and even, so I’m told, those who love Fifty Shades of Grey. It takes all sorts. I think I can understand the frustration of an academic historian. After publishing a book which took years of painstaking research, gained excellent academic reviews and sold very few copies it must be infuriating to see a novelist selling thousands of books which claim to be based on history but which to a serious historian could seem poorly researched, wildly inaccurate and full of mistakes. I do have a history degree so I’ve a little understanding of both sides of this argument. The truth is that some historical novelists are not trying to be accurate, they’re just trying to entertain, putting characters in old fashioned clothing but not caring about period detail or anachronisms or accurate timelines. It doesn’t mean people don’t or shouldn’t enjoy their books. It just means that they’re not intended to teach people anything about history. I’ve read some of these and personally they drive me up the wall. I can cope with honest mistakes but in some cases I think writers might do better to turn to fantasy where anything goes. Still, I refuse to be a snob about it. There are also some very well respected historical novelists whose work is clearly painstakingly researched but I just don’t enjoy their style. Many people do, it’s a matter of personal taste. I’ve recently come across an author called Jacqueline Reiter, who has written both a biography and a historical novel about the life of John Pitt, 2nd Earl of Chatham, the elder brother of the Younger Pitt who spent much of his life in the shade of his more famous father and sibling. I’ve now read both, and it’s confirmed what I’ve always suspected that it’s very possible to be both and excellent historian and an entertaining historical novelist. I would defy anybody on either side of this debate to be snobbish about Earl of Shadows which is the novel or to complain that the biography the Late Lord is anything other than a well-written and very scholarly work. Both historians and novelists could learn a lot from this writer and I hope she goes on to write a lot more. The books I’ve written so far are period specific and most of them include some real historical characters alongside my fictional ones. I try to research as well as I can. For A Respectable Woman I used a lot of primary sources and for “An Unconventional Officer” I read endless accounts of the war written by the men who fought it. The problem with these is that they are frequently contradictory in themselves; they were written years after the war and people forget. Wellington’s letters and despatches are a goldmine of information for the Peninsular War books although they’ve obviously been edited for publication. Even so, given the immense stress Wellington must have been under during those years, did even he remember everything? In the end, it only matters if you want it to matter. I love reading history, both novels and non-fiction, as long as it’s well written and enjoyable to read. I can sift through either and find what I want and the very obvious disagreements between academics over the interpretation of events means that I don’t feel guilty about putting forward my own interpretation in a novel. My characters might well have their own views about why something happened which contradict modern historians’ thinking, but then they’re not modern historians, sifting the evidence, they’re supposed to be ordinary people living their lives in a different time and like us they’re entitled to their opinions. I think I’ve done enough musing about marketing and the meaning of life for a while. Now it’s back to the writing, which in the end is what I love doing most and the reason that all this is happening. 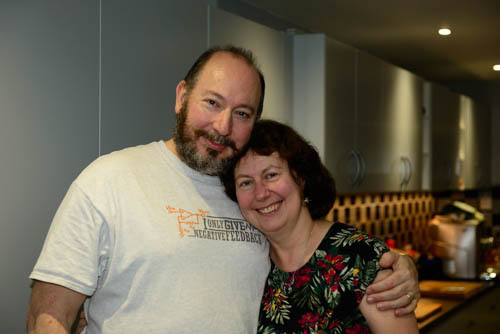 Twenty three years ago today I got married and the anniversary has made me think about love and marriage, an important issue in all of my books. Inevitably it was in a castle. Dalhousie Castle on the Scottish Borders is a beautiful place, converted into a hotel with a small chapel which as far as I know still does weddings. Ours was a small affair with only close family and two or three friends. We went on honeymoon afterwards and then came back and had a huge party with all our friends to celebrate. I write historical fiction with a strong element of romance so relationships and how they develop are of interest to me. I also spent years working as a relationship counsellor which meant I saw the ups and downs of more couples than I can remember. And I’ve been in a relationship now for around twenty seven years. Believe me, I’ve thought about love and marriage during all this. It’s the aim of a writer of romance, even if the romance is only part of the theme of the book, to try to make it realistic while still retaining the magical element of falling in love. A lot of romantic novels end with wedding bells, or at least with the couple falling into each others arms and admitting that after all their trials and tribulations, they want to be together. There’s something very satisfying about reading the last page, closing the book, and knowing that the couple that you have become attached to (hopefully) have worked it out. Of course they haven’t. They’ve just worked out the first bit. There’s a whole lot of work still to come which a lot of the time we don’t see. But because I do get attached to the characters I write about, I do wonder what happened to them next. In historical fiction, the drama of divorce would have been less common. Certainly before the Victorian era when divorce became slightly more realistic, although still very difficult, only the very wealthy could afford divorce which had to be confirmed by an act of Parliament. And it was only available to men. This didn’t mean that couples didn’t separate. For many it was a quiet affair, simply drifting apart and living separate lives. There was not always the same pressure for couples to spend all their time together as we have now. These days, if one partner takes a job which keeps them away for weeks, months or even years at a time, there is often an expectation that the marriage is going to fail. In the early nineteenth century, married officers and men in the British army might not see their wives or families for years. Some marriages did end during that time but a surprising number succeeded, helped along by endless letter writing and a determination to keep the relationship alive. There was probably a different attitude to adultery in some quarters, for men at least. It was not considered so shocking for a man to have relations with a mistress as long as he was discreet. In an age where many marriages, particularly among the middle and upper classes, were arranged for reasons other than love, one wonders how often both partners were unfaithful at times. Some of these marriages worked very well. Others did not. There are examples of both of these in the books I’ve written. I do wonder, though, if some couples pushed through their difficulties and came out stronger when divorce and separation were more difficult. Some, we know, lived in misery, and I wouldn’t go back to the days when divorce was seen as shocking. But relationships are tough at times and there’s a feeling of satisfaction in coming out the other side of a difficult patch and feeling close again. I’ve been thinking about the couples in my books so far and wondering how they’d do. Jenny and Will from A Marcher Lord will do well, I suspect. Both had parents who made successes of their marriages; Will’s had an arranged marriage and Jenny’s was a runaway love match but both worked. Jenny and Will would have led a busy and active life keeping castle and estates running successfully and they have already proved they make a good working team. They’ll argue, but they have shared values and interests and I think they’ll be fine. I’m planning a second book featuring this couple some time next year and I’m looking forward to catching up with them. Cordelia and Giles from The Reluctant Debutante come from different social backgrounds, but she’s already proved that she can make the shift into the Ton very well. I think both of them enjoy country life. They might argue about social obligations; she’s probably always going to be more social than he is, have better manners and be nicer to people. But they share a sense of humour and a love of the ridiculous and I think for Giles there will always be an enormous sense of gratitude to her. He was in bits after Waterloo and she’s a big part of his rehabilitation. There is a planned series of books set around the lives and loves of some of the men and women of the third brigade of the Light Division after the war, of which this is the second, so I think we will meet Cordelia and Giles again. Kit and Philippa from A Respectable Woman are the most interesting in some ways. Somebody who has just finished the book and loved it asked about a sequel and it has made me think how this marriage is likely to work. Of all of them the gap between these two is the widest. Philippa has a lot to learn about how to be a Countess and for all his protestations that she can do as she likes, Kit is going to need to learn to let her be herself. I think the key to this one is going to be for both of them to find something to do outside of the marriage so that neither of them feel smothered. They’re both used to being busy and having a job to do. The big advantage that they have is Kit’s mother, a very wise and understanding woman who is going to be a big help to Philippa. I think they’ll be all right but I suspect there might be a few fireworks along the way. Then we have Paul and Anne who began their journey in An Unconventional Officer. There is a lot about relationships in this and the subsequent novels in the Peninsular War saga. There’s no point in speculating about Paul and Anne because their story doesn’t end with the book, it continues through the series. We’re going to see how Paul and Anne and the other characters cope with trying to be together in the middle of a war and it’s not always likely to be easy. Welcome to a short biography of Giles Fenwick, hero of the Reluctant Debutante which is my bestselling book so far. At the age of thirty two, Giles Fenwick, Earl of Rockcliffe had earned himself a reputation in the polite world as a dangerous rake, adept at seduction and quick to boredom with the women he pursued. The matchmaking mammas had welcomed him with open arms three years earlier upon his return from Waterloo, a professional soldier come unexpectedly into the ancient title and accompanying fortune. These days, the Earl was aware that the same ladies eyed him askance and warned their delicate charges to avoid him if possible. There seemed no prospect of him doing his duty and marrying to secure the succession, and few mothers would have wanted to entrust their daughters to the scarred, cynical Earl with his unpredictable temper, his reputation for seducing married women, for keeping low company, having expensive mistresses in his keeping and for saying whatever outrageous thing should enter his head on any occasion. The nobility of his birth and the size of his fortune ensured his continued welcome in the houses of the ton. Rockcliffe, who had returned from the army reluctant to be in any kind of society, was sardonically amused at how easy people found it to ignore his behaviour when dazzled by his title and money. But he had little in common with most of the well born people who saw themselves as his equals, and at times found their company stifling and overwhelmingly tedious. Rockcliffe knew that the nature of his military service had a good deal to do with that. For many years he had served in the Peninsula under Wellington. Initially an excellent junior officer of light infantry, his intelligence, his talent for languages and his initiative had brought a transfer and he had served for much of the war as an exploring officer. These officers in Wellington’s army were under the command of the Quartermaster General. They operated on their own or with one or two local guides and their task was to collect first-hand tactical intelligence by riding to enemy positions, observing and noting movements and making sketch maps of uncharted land. The work was highly dangerous and required physical fitness, good horsemanship and a willingness to take risks. Captain Giles Fenwick had been a legend in Wellington’s army, his exploits talked of and laughed over in mess and over campfires. It was a solitary life, and bred independence and impatience with rules and conventions. Hardly the best training, the Earl thought wryly, swinging himself out of bed, for an Earl entering polite society. But he could have done better if he had tried harder. He had not wanted to. 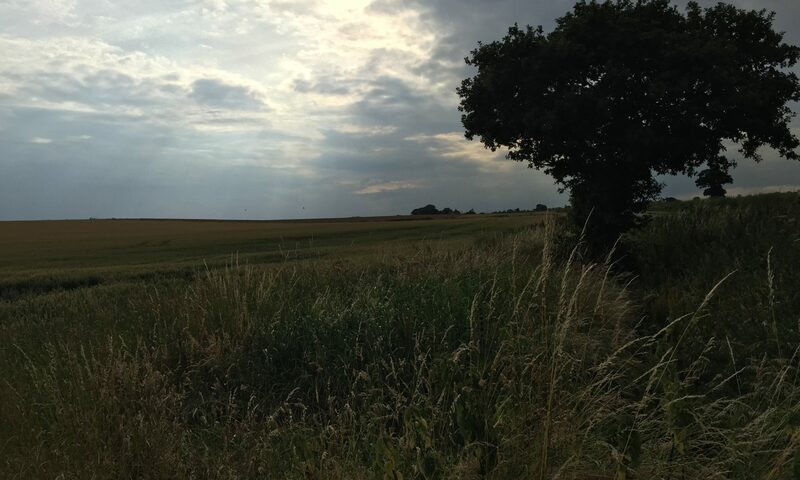 The years of danger and excitement, the fights and the killing had culminated in the horror of Waterloo where he had seen friends and comrades cut down around him. He had expected to die from the wounds received on that day. 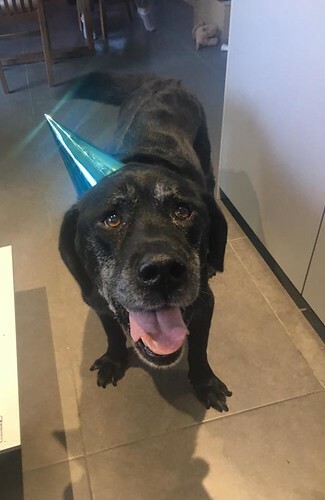 But he had lived, had come home to be courted and feted by the polite world who would have petted him and made a hero of him if they could. He could not bear it – and made no attempt to hide the fact. I’m delighted by how many people seem to be reading and enjoying The Reluctant Debutante which is now also available in paperback. By the time we meet him in a humble tavern on the London road in 1819, Giles has inherited a title from his uncle and is the Earl of Rockcliffe. It has been a difficult transition for Giles who was, for many years, a penniless young officer in Wellington’s army, initially in a line regiment and then as one of Wellington’s exploring officers. He returned to regular service for the battle of Waterloo where he was seriously wounded and lost Simon Carlton, one of his best friends. For anybody who would like to know more about Giles’ early years before he met and fell in love with a merchant’s daughter, you’ll be glad to know that the opportunity will arise during the course of the Peninsular War Saga as the regiment that young Ensign Fenwick joins is the first battalion of the 110th Infantry, commanded by the young and flamboyant Major Paul van Daan. 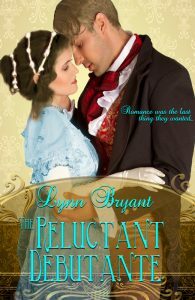 I wrote The Reluctant Debutante as a standalone novel and when I began writing the first of the Peninsular Books some time afterwards, the connection did not immediately occur to me. Giles was an exploring officer who operated away from the main army. However, as I spent more and more time researching Wellington’s army, it became clear to me that Giles would have started out in an ordinary regiment before being seconded to that post. We already know that he was poor, with no money to join the guards or an expensive cavalry regiment, and we also already know that his uncle, whom he visited, had an estate in Leicestershire, the home county for the 110th. Giles is a few years younger than Paul van Daan. When Paul joins the 110th in 1802 he would have been just fifteen, still at school. But it did not seem unreasonable that when he was looking to join the army, he might have found a commission in the local regiment, the 110th cheap to buy, just as Carl Swanson did some years earlier. Moreover, I had a strong feeling that the young Giles Fenwick was probably the sort of lad who would catch the attention of Major van Daan and his clever wife. They like young officers with a strong personality and a lot to offer and Lord Wellington was always looking for men who might be suitable for his Corps of Guides. After that the connection was obvious. Giles does not appear in the first book, although he joins the 110th in 1805 when he is eighteen. But he has the misfortune to be commissioned into the seventh company of the first battalion under the disaster that was Captain Vincent Longford, which means it is going to be some years before he finds himself under the command of Major van Daan. What happens then and how he becomes an exploring officer will be told during the course of the series. Giles Fenwick also makes a cameo appearance in A Regrettable Reputation which is now the first book in the Light Division Romances, a series which follows the stories of some of the supporting characters from the Peninsular War Saga back into civilian life after the war. 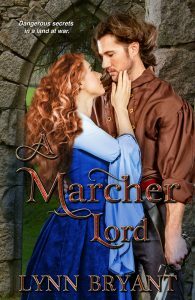 My third standalone novel, A Marcher Lord is from a different time period entirely. However, the Scottish borders have provided fine soldiers to His Majesty’s armies for many hundreds of years. I have a strong suspicion that although nobody would know it, some red haired descendent of Will and Jenny Scott would have been fighting alongside the Van Daans, the Fenwicks and the Clevedons on Wellington’s front line. I’ll let you know if I run into him at some point. Only a brief and somewhat informational post today to remind everybody of the free promotions coming up over the next few weeks. The Reluctant Debutante on 30th April and 1st May. May 30th will see the publication of the first book in the Peninsular War series. 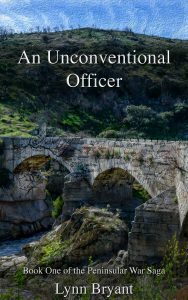 “An Unconventional Officer” tells the story of Paul van Daan, a young officer who joins the 110th infantry in their light company in 1802 and travels through India, Italy, Ireland, Denmark and then into Portugal. His fortunes are linked to those of the young and ambitious General Arthur Wellesley whom he meets in India, and his personal life is dominated by two very different women. Rowena Summers, the shy young governess who becomes his wife and his steady companion. Anne Howard who marries one of his officers and changes his view of women forever. 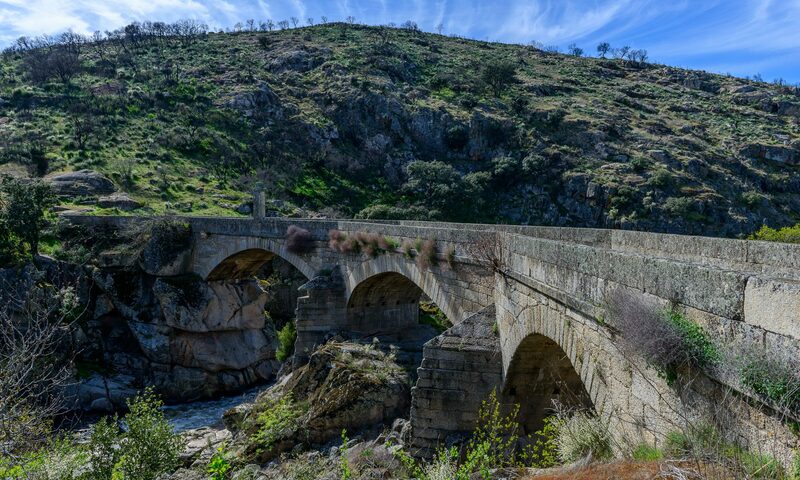 Against the backdrop of Wellington’s war in Portugal and Spain,the Peninsular War Saga will follow the fortunes of the officers, men and women of the 110th infantry, a regiment unlike any other in the British army. The first four books have now been published on both Kindle and in paperback on Amazon and the Kindle versions now have new covers.